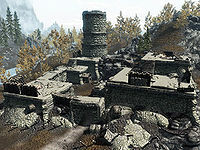 Treva's Watch is a fort situated to the southeast of Ivarstead and to the west of Riften. It is a medium-sized fort occupied by a large number of leveled bandits, including two bandit chiefs. If you have not already obtained it, you may wish to get the quest Infiltration before entering for the first time from Stalleo, who is found camped with two bodyguards just to the east of the fort. The related quest directs you to access the watch through its secret entrance: Treva's Watch Escape Tunnel. The fort is located on a path leading from Ivarstead to Riften on the north shore of the Treva river. A camp inhabited by Stalleo and his two bodyguards is located by a secret back entrance to the fort, which is east of the main entrance. There is a cart containing a food barrel and sack nearby. Speaking with Stalleo, you can offer your services helping reclaim his home. Approaching the fort will cause several bandit archers to fire upon you from the walls. The main courtyard area comprises several levels and is initially occupied by six bandits, including archers and some heavy hitters. If exiting into the courtyard from the main keep, you appear inside a wooden hut with a lever that lowers the spears blocking access to the courtyard for Stalleo and his bodyguards, although you may wish to wait until you've taken care of any remaining bandits, especially at higher levels. Opposite are wooden stairs leading up to the battlement and a campfire with four whole salmon hanging over it, a long wooden table behind with five seared slaughterfish steaks and three bottles of wine. To the right of this is a set of shelves holding two more bottles of wine. To the east are more stairs leading up to a higher level where another campfire has been lit with two lean-tos with unowned bedrolls under them around the fire and an unlocked chest and long wooden table beside one of these. Typically you will enter this fort through the secret entrance, that leads to the basement. This leads to a man-made tunnel descending to the west before turning to the south and climbing a flight of stairs. At the top are three bandits, two archers and a melee fighter. They are all standing in an oil slick with an oil lantern hanging above. Behind them is a long wooden table with six loose iron arrows, a loose random arrow, a bottle of wine, loaf of bread with a random bow leaning against the table. To the left is a food barrel and to the right a set of shelves holding two sheaves of wheat, some bread and cheese wheels. The room opens up to the west, with a passage heading south and beyond this to the west a storage area on a slightly raised platform guarded by a bandit sitting at a long wooden table. On the table is a random sword, a random cuirass, a medium coin purse and a leather strip. Behind this are two sets of shelves separated by an unlocked chest, with a second unlocked chest to the right of the shelves. The shelves hold a single random arrow, two empty random soul gems and two food sacks. Following the passage south, you can hear someone working at an anvil, hammering metal, the passage takes a couple of turns before you pass a bear trap in the middle of the floor, just after this the passage turns to the east. In front is a flight of stairs leading up into an L-shaped room with a smaller room ahead through a large doorway. This is where the person working with metal is located. The smaller room contains a workbench, grindstone, anvil and two sets of shelves, one of these hold a piece of iron ore, six iron ingots, four leather strips, with a fifth strip on the workbench. The other shelves hold a random light armor cuirass and two pairs of light armor boots, a shield, and two swords. There is a second wide doorway out into the L-shaped room. Here there are three more sets of shelves and a small unit which between them hold many small barrels of mead, a woodcutter's axe, three bottles of alto wine, seven bottles of wine, six bottles of Nord mead, two random potions of healing and a random potion of regeneration. To the west is a small storeroom filled with many food barrels and the bodies of two Nords and an Imperial, presumably family and members of Stalleo's household, related to the Infiltration quest storyline.. A door to the south opens into Treva's Watch. The entrance from the Escape tunnel leads into a passage that twists and turns, with two bear traps on the floor. Ahead are stairs leading up to a wider passage. Just before the stairs there is an alcove on the left with a short passage opposite that ends at a cave-in. At the top of the stairs is a bandit with a second farther back out of sight, but who will be alerted even to a stealthy kill. Where the passage widens there is a cupboard on the left with a long wooden table opposite. On the table is a bucket containing two bottles of wine, while the cupboard holds a knapsack, an iron mace and a woodcutter's axe. The passage continues to the south before a doorway on the right opens into a dormitory where two bandits one sleeping in the first bed, the second standing at the rear of the room. Any fighting may alert one of the Bandit chiefs to your presence. There are a total of three single unowned bed in the room, an unlocked chest at the foot of the middle one and two sets of shelves against the wall holding three random cuirasses, a random poison, a flute and several common books. Opposite the doorway is an adept-locked door that opens into a small storeroom containing an unlocked chest, tall wardrobe and a set of shelves holding a random greatsword, an apothecary's satchel, a random potion of healing, a random potion of magicka, a helmet and two food sacks. There is also a food barrel with a large coin purse on top. Continuing along the passage, you pass an alcove on the right containing a set of shelves holding a random sword, mace and bow, two random pairs of boots and a random helmet. Just beyond the alcove the passage turns to the west and passes a doorway on the left, which is where the bandit chief will be found if not previously alerted to your presence. In this room is an unowned double bed, a dresser, a tall wardrobe, an unlocked chest and a long wooden table with a copy of the spell tome: Bound Sword on top. The passage turns to the north at the far end and leads out onto a balcony over a dining room, where three bandits can be seen sitting at a pair of tables laid end-to-end, chatting to each other. On the balcony is a long wooden table with two common books and a goat cheese wedge on top. Farther along is a set of shelves holding a leather strip, a leveled potion of strength and a leveled potion of regeneration. To the left are a stack of straw bales with stairs leading down to the left. At the bottom there is a second pair of tables under the balcony with many chairs pulled up to them both. To the left of the stairs is a tall wardrobe containing clothes. To the west is a doorway out into a narrow passage. There is a cave-in at the south end of the passage. After a few paces north the passage turns west and opens out into a kitchen where two more bandits can be found. There are many tables and small units down the middle of the room with two campfires against the west wall, one has a kettle in the flames and the other has a proper cooking pot over it. On the tables and units are two joints of raw beef, three carrots, an apothecary's satchel, a rack of dog meat, three chicken breasts and a woodcutter's axe. On a shelf under one of the units is a bottle of alto wine, three bottles of wine, a random potion of stamina and two random potions of healing. Hanging from racks over one of the tables are two rabbits, a pheasant, two garlic braids and a bunch of dried elves ear. There is a set of shelves against the west wall holding clutter and a long wooden table against the north with a bottle of wine between two small mead barrels. In the northwestern corner is a doorway into another room containing several food barrels and sacks, two more sets of shelves holding several more food sacks and an unlocked chest, with a wooden door to the north. This opens into a wide passage, to your right, on the floor is a bottle of alto wine and a large coin purse and beyond that a doorway with some rubble on the left, behind this is raw leg of goat and a small coin purse. The passage ends at the other side of the cave-in seen previously. Take care heading west, as just before the corner, there is a pressure plate on the floor that triggers a spike wall hinged on the right wall. Around the corner a narrow passage leads off to the west and climbs a short flight of stairs before opening out into large circular room with a table and set of shelves in the middle, many food barrels in stacks around the outside and a couple of carts on the right. On the set of shelves is a piece of iron ore, six iron ingots and two leather strips, with another piece of iron ore on the table as well. To the south is a wide doorway with a passage opposite and curved stairs rising on your right. Partway up the stairs is a bandit standing guard near a long wooden table. They are standing in an oil slick with an oil lantern hanging above. At the top of the stairs is another large circular room, half of which is raised up a couple of feet with stairs at either end. On this raised section you will find the second bandit chief along with one more bandit. There is an arcane enchanter, with an unlocked boss level chest, a set of shelves holding six iron ingots, an iron mace and red apple to the left with a tall wardrobe and dresser back-to-back with them. They both containing clothes and a ladder leading outside on top of the tower beside them. To the right of the enchanter is a long wooden table holding a knapsack, a bottle of the rare enchanter's elixir, an iron dagger, a bottle of wine, a small coin purse, a copy of the spell tome: Courage, and copies of Ruins of Kemel-Ze and the Enchanting skill book Twin Secrets. Behind the table is another tall wardrobe and a set of shelves holding a giant sized apothecary's satchel, a salt pile, an iron dagger, a copy of On Oblivion. On the lower level between the two flights of stairs is another set of shelves holding several more common books, a pair of leather bracers hidden in a cast iron pot, two sheaves of wheat and a thistle branch. Using the ladder gives you a good sniping opportunity to deal with the remaining bandits outside. There is also an unlocked chest on the roof. From the bottom of the stairs following the passage to the south you pass two doorways into prison area on your left, where two bandits are found talking. There are two cells; one adept-locked and the other apprentice-locked along the eastern wall. Between the two cells, on a hook on the wall or fallen to the floor is a key that opens the cells. In the center of this room are two long wooden tables side-to-side in the middle, with many empty wine bottles in a stack of open crates beside them and on the floor loose. On the tables are two legs of goat roast, a horse haunch, two bottles of wine and some bread. On the floor, beside the table is a basket of red and green apples. Between the two doorways are two tables, one of which has a random dagger on top. Beside this is another basket of apples. In the northwestern corner is a cupboard with three bulbs of garlic, a gourd, a gold coin, a pair of boots and a set of fine clothes on the shelves. Against the north wall is a tall wardrobe and to the right an unlocked chest, with more food barrels in the northeastern corner. Finally against the south wall is another table with an eidar cheese wheel on top. Continuing along the passage, take care as a pressure plate that triggers a poison dart trap is a short distance past the prison area. Past this on your left is a doorway into a room with a bandit sitting at a long wooden table on the left with a bottle of wine on top, while against the south wall is a tall wardrobe and set of shelves holding several tiny food barrels, and an iron greatsword. There is a pile of firewood opposite with a woodcutter's axe leaning against it. To the east is a door leading outside into the courtyard. Before exiting, the passage continues past this room and another pressure plate that triggers a swinging mace trap before ending at a cave-in with an unlocked chest among the rubble containing minor loot. There are two iron ore veins found on the shore to the south and west of the fort and on the far side of the river to the west is also a clay depositHF. Treva's Watch is built over the land of the former Treva's Farm found in ESO. Despite returning the fort Stalleo's care, they return to the camp and never take control of the fort, the bandits respawn enabling you to repeatedly clear it of bandits. This page was last modified on 16 April 2019, at 23:14.